Through her loving example, Verna Strotbaum was a nurturing and kind woman. A true “Westsider”, she was a friend of many, and it was a joy to share her company and her uncanny sense of humor. More than anything, Verna was dedicated to all things entrusted to her care. Whether for her family, work, or her home, she gave it her all, and then some. For these things and so much more, Verna will be dearly missed by those who knew and loved her best. The crash of the stock market in late 1929 created financial turmoil from coast to coast, and by 1930, 1,350 banks had failed in the U.S. The entertainment world was a welcome deviation from everyday worries and music played a vital role in keeping spirits light in addition to the introduction of the infamous cartoon character, Betty Boop. During these changing times in the riverfront city of Grand Rapids, Michigan, the birth of Verna Ruth on December 5, 1930 found her parents, William and Tressa (Van Overen) Wanrooy with much to be thankful for. Her father supported their household as a bricklayer while her mother remained at home as a homemaker with Verna and her two siblings, Audrey and Bill. Verna enjoyed a childhood typical of the times. The Wanrooy family made their home at 1445 Tamarack Avenue NW where fun and playful times were shared with her friends and siblings, as well. Verna remained close to her brother and sister throughout their lives for which she considered herself blessed. Together they spent happy times making memories at Ramona Park roller skating and ice skating at Richmond Park. Memorable times were also enjoyed during the holidays spent with family. Verna attended Harrison Park Elementary and went on to graduate from Union High School with the Class of 1949. Following high school, Verna landed a job and like most young women, she had hopes of a bright future. That future came to include love when she met Don Strotbaum, a handsome young man who worked for the City of Grand Rapids. Playful at heart, he got Verna’s attention one winter throwing snowballs at her every time she went out for lunch or left work for the day. The two began dating and before long they found themselves deeply in love. On March 2, 1951, they were happily married at Second Congregational Church and a wonderful honeymoon to Niagara Falls followed. Verna and Don set up house in Grand Rapids and just as they barely celebrated their first year of marriage Don was drafted to serve in the U.S. Army during the Korean War. Although the next two years were difficult, Verna was able to count on her family and good friends to keep busy. When Don returned home to her awaiting arms after receiving his honorable discharge in March of 1954, it wasn’t long before they built their forever home at on Clover Drive NW. In December of 1955 they welcomed the birth of their son, Terry, and in May of 1957, their daughter, Amy completed their family. A loving and attentive mother, Verna made a good home for Don and the kids. She was a good cook and made many delicious, family favorites throughout the years. While Verna’s first priority was always her family and being a homemaker, as the kids grew older she began working at Sandy’s Donuts where she remained for 30 years. There she became a good friend to many of the regulars and even on her days off, Verna would meet up with her friends at 10:00 AM for coffee and some social time. In her free time she enjoyed reading, knitting and time spent around the pool. Verna enjoyed their vacations to Mackinaw Island, Mammoth Caves and to Florida. Most important in her life were her four grandchildren and two great-grandchildren with whom she loved and enjoyed very much. As a longtime member of Trinity Congregational Church, Verna held fast to her faith and family when her beloved Don passed away in 1997. Having taken much pride in her home, Verna’s most cherished possession was the very place that held her most treasured memories. She remained living in their home on Clover Drive until several health issues gave cause to her residing for a short time at Covenant Village of the Great Lakes. With much sadness, Verna could not overcome her health issues, yet for those who came to know her, she will be remembered with joy. A kind and loving woman, she easily brought a smile to the days of others with her quick wit and caring nature. She taught her children well, and her legacy lives on in the hearts of those who follow. Although she will be deeply missed, fond memories will prevail with the very thought of Verna Strotbaum. Mrs. Verna R. Strotbaum, age 87, of Grand Rapids, passed away on Tuesday, December 19, 2017. She was preceded in death by her husband, Donald and brother, Bill (Charlotte) Wanrooy. Verna is survived by her children, Terry (Patty) Strotbaum and Amy (Keith) Suttorp; grandchildren, Mandy Suttorp, Nick (Marcie) Suttorp, Jason (Ashley) Strobaum, and Kyle (Krystal) Strotbaum; great-grandchildren, Arabella and Harper; sister, Audrey (Bill) Davis; several nieces and nephews. The Funeral Service will be held at 11:00 AM on Friday, December 22, 2017 at Heritage Life Story Funeral Home, 2120 Lake Michigan Dr. NW. Friends and family will gather for visitation from 2-4 and 6-8 on Thursday at the funeral home. Interment in Greenwood Cemetery. 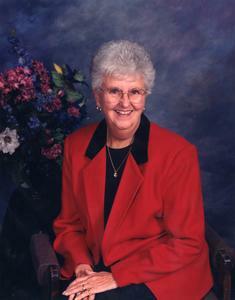 Contributions in Verna’s memory may be made to Faith Hospice or Trinity Congregational Church. Please visit www.lifestorynet.com to share a favorite memory or photo of Verna and to sign her online guestbook.